Has Anything Changed in My Lifetime? I’ve just been leafing through a magazine. There’s a two page ad for a slow cooker, an article on pendant lighting, a feature on vintage needlework samplers, another about a lady who gave up London life to make cheese in the countryside, there are recipes for 1920s cocktails and there’s a section on breast cancer screening. The kind of things you find in most lifestyle glossys. I’ve no idea where I got the magazine from. I found it in a folder I keep cookery magazines in. I reckon I picked this up at a flea market. 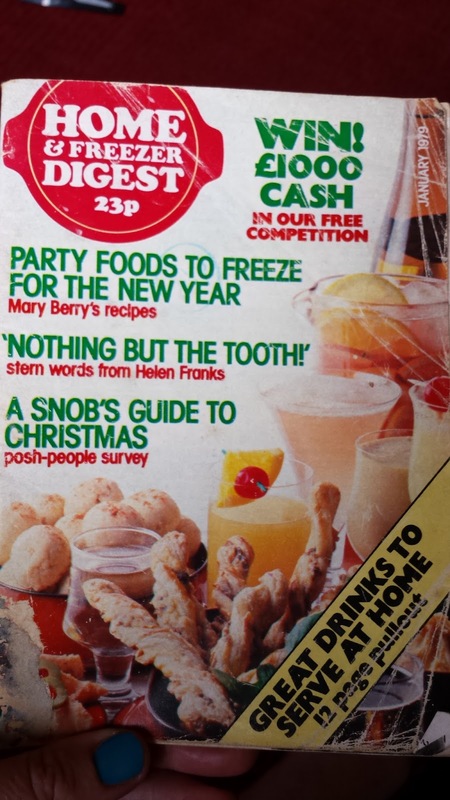 The reason I think that is that it is an issue of Home & Freezer Digest from January 1979, the month I was born. As I flicked through the pages and saw all these familiar and relatively current topics, I wondered to myself whether anything has really changed in the world in my lifetime, so far. Apart from the price of magazines, that is. This issue cost 23p back in the day! On closer inspection, however, I see that life is very different now. For a start, there is a full page ad for cigarettes in the magazine. This was seventeen years after the Royal College of Physicians in the UK called for restrictions on tobacco advertising. The ad does bear a warning and only shows a cigarette in a hand rather than being smoked, but it is still an unfamiliar sight by today’s standards. Speaking of current standards in society, there is a tiny secton on women’s lib, a phrase you don’t hear so much these days. You can’t deny that things have come a long way since the 1970s. But funnily enough, what is said in the short article is still as true now as it was back then: “One of the great difficulties women face is putting themselves first without feeling guilty“. I don’t know one mother out there who doesn’t know the feeling of mummy guilt. Do you? The change in society is clear too from the advert for a Crock-Pot slow cooker across page 62 and 63. While the slow cooker is a gadget that has made a comeback over the last few years, the version being advertised here is the “family-size pot for 6-8 people”. How many families would need that on a day to day basis nowadays, where most families have less than three children? Quite an obvious difference I’ve observed is the food and how it is styled. The serving suggestion for this glazed bacon is typical of the era. Looking down through the recipe, you’ll see that this is far from the current clean eating fad. The tinned peaches actually get heated up and have 25g brown sugar added to them before serving! I almost feel the need to brush my teeth just thinking about it. It was no surprise then to read at the end of the four page article wittily entitled “Nothing But The Tooth” that “by 45, only one person in two still retains any natural teeth” and “7000 fifteen-year-olds are fitted with NHS dentures every year”. Enjoyable though it was to be able to travel back in time a little and get feel for life around the time I was born, I’m glad for all the changes and I’m certainly planning on hanging on to my own teeth for quite a while yet. How interesting. That teeth stat is scary. I wonder what the current stats are? I'd hope they'd be better and that we are giving better oral hygiene education but I fear they'll be worse the amount of sugar in so many things now. Ooh, I love looking through old magazines – and you're right, essentially very little has changed! The sugar is scary though – can you imagine someone seriously suggesting giving your child lucoazade these days?! What wonderful insights. I think I prefer this sort of serendipitous journey into the past to curated time capsules. Yikes on the teeth. I'll have to bring that up next time an older person tells me, “I fed my kids 3 lbs a suger a day and they're just fine!” Thanks for linking with #TwinklyTuesday. They really do give such a good insight into how everyday life was back then. I was fascinated flicking through it. Thanks for popping by Baby Isabella! The changes are fascinating me. I wonder what my boys will think of life in 2008 when they look back as adults. Yes, scary. Now it all so hidden in jargon even though the dietary info is all on display. There is a funny balance between what hasn't changed at all and what has changed radically. I remember Lucozade more or less as medicine when I was small but then being revamped as a sports drink. The Bavarian loves it but I wouldn't give it to the kids. They'd go nuts on all that sugar and fizz! When I moved to Germany in 2003 people could still smoke in offices. I've never smoked but I sat between two chain smokers in an open plan office. Ugh!!! Thanks for popping by Jess.